This bread recipe is my personal favorite. Not only is a great alternative for people with nut allergies, but it's is rich with rosemary and garlic and toasts perfectly. The best way to eat any bread, in my opinion, is as toast, and this recipe is no exception. Toast it up on the stove or in the oven and top it with some K﻿﻿﻿﻿errygold Butter! We promise you this bread recipe will change the way you enjoy keto bread. If you weren't already aware, we've perfected the almond flour bread recipe, which means we were left with no choice but to make the best coconut flour bread recipe! I'll be honest here when I say that I prefer the coconut flour bread by a long shot to the almond flour bread. Not only is it a lot more flavorful, but it lacks any of the "eggy" texture you might find with the almond flour bread. A tip for storage that we've encountered is that it stores well in the fridge for up to five days, if it can last that long! But baking with these flours can be tough, especially at first. Only after using them for a while can you really get a grasp of how they will impact your baked good and how much is truly needed. For example, almond flour is a lot less absorbent, so you need significantly more in comparison to coconut flour which is highly absorbent. And, being that you generally need less coconut flour for a recipe is what makes it my favorite flour to work with. It also has a subtle coconut flour taste and creates a denser, moist bread! This bread recipe is not our only coconut flour recipe. In fact, two of our most popular recipes are coconut flour based, our 3 Minute Low Carb Biscuits and Low Carb Fudgy Brownies! How could you even say no to attempting those recipes - one takes less than five minutes to make and the other is the best dessert ever, brownies! If you are using coconut flour for the first time, however, I recommend making our rosemary and garlic coconut flour bread to get a full understanding of how amazing of an alternative flour it truly is! 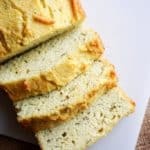 Recipe can be quickly added to MyFitnessPal - Search "KetoConnect - Coconut Flour Bread"